Peru: When to go? What will the weather be like? Based on seasonal weather and best times to visit, our blog this week will help you plan your Peru holiday to climatic perfection. It’s true that you can visit Peru on holiday almost any time of the year, but some months offer better weather for certain activities. Peru is located in the southern tropics (latitudes 0º to 18º), but with three main terrains to think about (Andes, Amazon, coast), from jungle basins to soaring 6,000m+ peaks, it can be tricky to know when to go. When it’s good in the mountains, the coast is misty, and when it’s nice on the coast, it’s raining up high. Read on for more. 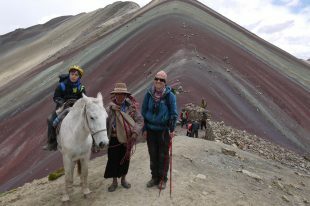 The best trekking months in Peru (and Bolivia too) are May to September (winter), and a great time for the Inca Trail. Expect clear blue skies, sunny days, chilly nights especially at high camps, excellent visibility and peak season for mountaineers. Best and only time for climbers to attempt the big peaks in Huaraz/Cusco. In the cloud forest, e.g. around Machu Picchu, daytime conditions are generally warm or hot, and evenings cool. April and October/November hold afternoon shower risks, but nights are milder and also the quietest in terms of numbers of trekkers. December to March is the rainy season (summer) and can get seriously wet and muddy on treks, mainly because of afternoon downpours. But you will dry off quickly in the sunshine and nights are much milder. Ice-climbing is not recommended at this time. However, mountain weather is notoriously fickle and so it can rain on treks in the dry season and be gloriously sunny during a rainy season hike. Year-round, weather conditions in the Amazon are hot and humid, although the lowland rainforests of Tambopata and Manu lie far enough south of the equator to provide a ‘cooler’, drier winter season between May and October. Note that around 80% of annual average rainfall – approx. 2,000 mm in Manu and Tambopata and 1,400 mm in Iquitos – occurs in the wet season (Nov to April). Many Manu lodges close Dec-March for this reason. The costa or coastal region is a narrow ribbon of desert 2,250 km long, crossed by fertile river valleys flowing from the Andes. From May to October, Lima is often overcast as the cold Humboldt sea current gives rise to a blanket of mist – the garua – which hangs above coastal cities. There are sunny spells and minimal rain. Inland, climate is generally warm and sunny. Average max/min temperature in Lima: 20ºC /13ºC. On the north coast, it’s generally sunny with average max temp: mid to high 20’s ºC. From Nov to April, Lima is generally warm and sunny as is the coast. Average max/min temp in Lima: 25ºC /19ºC, & on north coast, 30ºC/20ºC.